From the outside, Amy (Mila Kunis) has a perfect life - a great marriage, over-achieving kids, a beautiful home and a fulfilling career. However she's over-committed and exhausted to breaking point. An encounter with PTA Queen Bee Gwendolyn (Christina Applegate) and her clique of devoted 'perfect' moms, pushes Amy over the edge. Along with two other stressed-out mums - Carla (Kathryn Hahn) and Kiki (Kristen Bell) - Amy embarks on a quest to liberate herself from conventional responsibilities and to have some much needed fun. 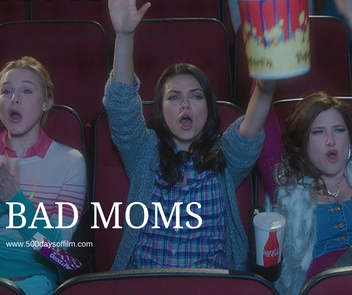 Okay, so here’s what you need to know about Bad Moms. It is funny - laugh out loud funny. And, not all of the best bits are in the trailer (shock). In addition, this film features two funny, engaging and endearing ‘mom’ characters (Kunis and Bell) and one stand out work of comic genius (Hahn). And, mother or not, you will find it hard not to sympathize with the Bad Moms' as they strive to achieve today's concept of perfection. Writer/directors, Jon Lucas and Scott Moore (The Hangover), have certainly packed Bad Moms with enough gags to make for a fun night out at the cinema. I laughed all the way through this film and I was not alone. Mila Kunis is fun to watch. I warmed to Amy instantly - although it is, at times, hard to relate to her because she is, well, Mila Kunis. Meanwhile Kristen Bell is brilliantly funny, Christina Applegate makes for a great PTA villain and Kathryn Hahn is a crude comedy revelation. However, don’t go into this movie expecting Bridesmaids. Bad Moms does not come close to the standard of Paul Feig’s genre-defining film. Instead it plays it safe (and rather predictably so). There are no surprises here and the film’s message (about doing less and focusing on what is most important) is laid on thick. Despite this, the message from these Bad Moms (who are really not very bad at all) still hit a chord with me. So what if this film is pretty much all surface. What does it really matter if no character is developed beyond her (or his) punchline potential. Sometimes you just want to go to the movies for a laugh and some fun. And, in a year of disappointing comedies, Bad Moms more than delivers some much needed laughs. Stay through to the end credits… it is pretty sweet. Have you seen Bad Moms? If you have, what did you think of this film? Did you, like me, laugh all the way through? Or did you think it was an opportunity missed and that this film should have been sharper with more depth?